Album This song officially appears on the Sound City: Real to Reel Official album. Foo Fighters’ Dave Grohl has revealed that his collaboration with Paul McCartney, ‘Cut Me Some Slack’, was written and recorded in just three hours. You can hear the collaboration, which was unveiled at the New York Hurricane Sandy 12-12-12 benefit gig on December 12 (2012) and also featured former Nirvana members Krist Novoselic and Pat Smear, below. “Cut Me Some Slack” is a song by Paul McCartney, Dave Grohl, Krist Novoselic and Pat Smear from Grohl’s film Sound City and its soundtrack. The song was first performed at the 12-12-12 benefit concert by the four, and was released on December 14, 2012, through Youtube. The song was a jam featuring McCartney and the surviving members of Nirvana, and it was described by McCartney as a “Nirvana reunion”. 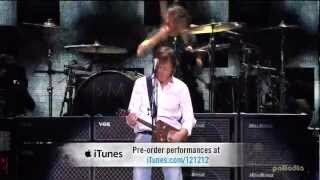 The four also performed the song, along with a number of Beatles songs, at a Paul McCartney concert in Seattle (Nirvana’s home town) on June 19, 2013. The song was recorded as a jam. Various artists were assembled by Grohl to record Sound City, including McCartney. The song was received well by critics. Allmusic called it a “tune with an immediate hook [and] melody”. The song won the Grammy award for Best Rock Song in 2014. Did your mama, set me free? “Cut Me Some Slack” has been played in 3 concerts.